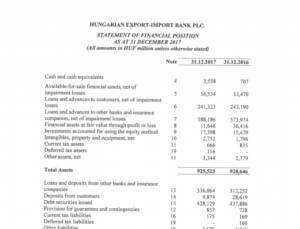 The objective of the Hungarian Export-Import Bank Plc. (Eximbank) and the Hungarian Export Credit Insurance Plc. (MEHIB) is to serve Hungarian exporters through the provision of effective financing and insurance facilities. Acting as a tool for providing economic-policy incentive, the mission of Eximbank and MEHIB is to support Hungarian exporting enterprises in facilitating the retention of jobs, growth in employment and an expansion of Hungary’s export capacities. The state-owned Eximbank and MEHIB perform the tasks of Hungary’s export credit agency, which are regulated by the legislative frameworks of the OECD and the EU, with the basic objective of facilitating the sale of Hungarian goods and services in foreign markets. The Bank and the Insurer, which operate within an integrated framework, carry out their duties with a shared organisation and corporate identity, under the name of EXIM. Summary video of Hungarian Export Credit Insurance Ltd and Hungarian Export-Import Bank plc (EXIM) and how it operates in Hungary. EXIM – Pureco Kft. sikersztori. What types of products and services does Hungarian Export Credit Insurance Ltd and Hungarian Export-Import Bank plc (EXIM) offer in Hungary? Here is a list of the products that EXIM offers for its members. It is all summarised. Eximbank is based in Budapest and operates offices in eight other towns and cities in Hungary (source in Hungarian). In September 2014, National Assembly representatives from the Fidesz–Christian Democratic People’s Party alliance and the nationalist party Jobbik voted to amend the law governing the operations of Eximbank in order to make it possible for party officials to serve as the CEO of the bank and to sit on its board of directors and supervisory board (source A, B and C in Hungarian).